Metabolic pathways are frequently altered within tumors to support the energy demands of rapidly dividing cancer cells. Even though metabolic reprogramming within tumors is well documented, the regulation of this process is not fully understood. Steroid receptor coactivator 2 (SRC-2) is a transcriptional co-regulator of nuclear receptors and other transcription factors that has been shown to coordinate energy homeostasis. Subhamoy Dasgupta and colleagues at Baylor College of Medicine demonstrate that upregulation of SRC-2 in prostate cancer cells drives glutamine-dependent de novo lipogenesis, which in turn supports tumor cell survival and eventual metastasis. SRC-2 was activated by mTORC1 in response to glutamine-dependent signaling. Once activated, SRC-2 co-activated SREBP-1, resulting in increased expression of lipogenic enzymes. Metabolic profiling of patient samples revealed that compared to localized prostate tumors, metastatic prostate tumors display a prominent SRC-2–driven metabolic signature. Moreover, in murine models, inhibition of SRC-2 reduced growth and metastasis of prostate tumors. Together, the results of this study indicate that SRC-2 acts as an oncogenic driver of metabolic reprogramming and suggest that targeting SRC-2 has potential as a possible strategy for limiting metastatic prostate cancer. 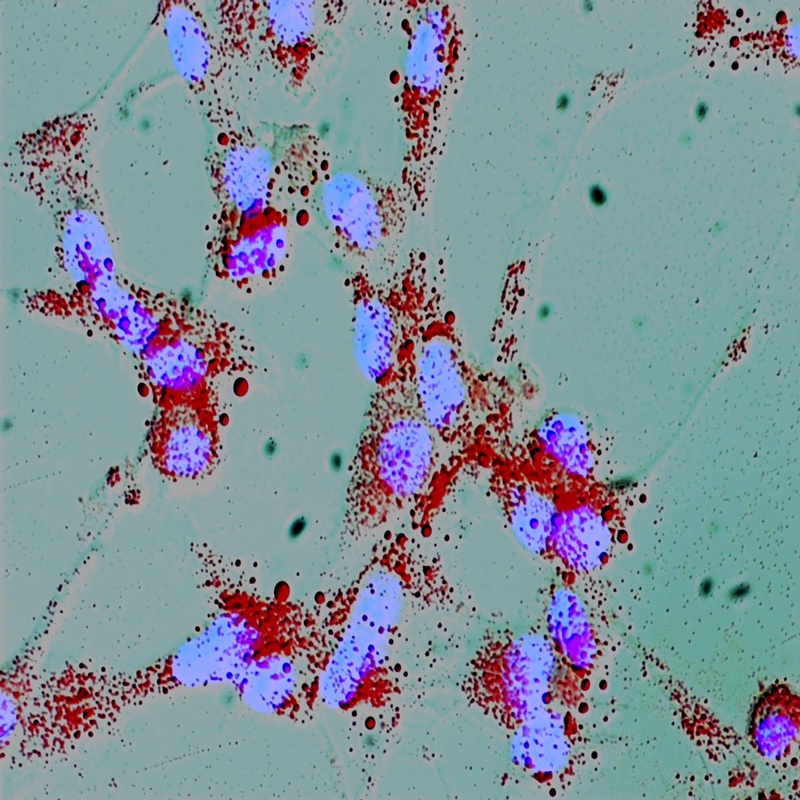 The accompanying image shows advanced prostate tumor cells that have undergone metabolic reprogramming, resulting in lipid biosynthesis (red) from glutamine. Cell nuclei stained blue with DAPI. Citation Information: J Clin Invest. 2015;125(3):1174-1188. https://doi.org/10.1172/JCI76029. Metabolic pathway reprogramming is a hallmark of cancer cell growth and survival and supports the anabolic and energetic demands of these rapidly dividing cells. The underlying regulators of the tumor metabolic program are not completely understood; however, these factors have potential as cancer therapy targets. Here, we determined that upregulation of the oncogenic transcriptional coregulator steroid receptor coactivator 2 (SRC-2), also known as NCOA2, drives glutamine-dependent de novo lipogenesis, which supports tumor cell survival and eventual metastasis. SRC-2 was highly elevated in a variety of tumors, especially in prostate cancer, in which SRC-2 was amplified and overexpressed in 37% of the metastatic tumors evaluated. In prostate cancer cells, SRC-2 stimulated reductive carboxylation of α-ketoglutarate to generate citrate via retrograde TCA cycling, promoting lipogenesis and reprogramming of glutamine metabolism. Glutamine-mediated nutrient signaling activated SRC-2 via mTORC1-dependent phosphorylation, which then triggered downstream transcriptional responses by coactivating SREBP-1, which subsequently enhanced lipogenic enzyme expression. Metabolic profiling of human prostate tumors identified a massive increase in the SRC-2–driven metabolic signature in metastatic tumors compared with that seen in localized tumors, further implicating SRC-2 as a prominent metabolic coordinator of cancer metastasis. Moreover, SRC-2 inhibition in murine models severely attenuated the survival, growth, and metastasis of prostate cancer. Together, these results suggest that the SRC-2 pathway has potential as a therapeutic target for prostate cancer.